Sound "An exercise in chasing hyperbole -- music exuded a natural ebb and flow, which somehow just seemed right"; "the overall sonic balance...is particularly neutral, exhibiting little in the way of tube euphony or solid-state grain"; "voice in particular was well served." Features "A minimalist design" with only "two balanced inputs along with two balanced outputs, all using Neutrik XLRs;" "designed from the ground up as a dual-mono, fully balanced circuit with four 6922 tubes"; four stepped volume controls, each of which controls half of the phase per channel. Use "Not for everyone -- those seeking remote control or extreme switching flexibility will have to look elsewhere"; accepts only balanced sources, but Blue Circle includes a set of adapters. Value "Not a cheap ride, but the sonic thrills are memorable." The Blue Circle AG3000 is not your average preamplifier. This became starkly apparent to me the moment I unpacked it and drew in a sharp breath of surprise/shock -- its blue! No, it wasnt an attack of early winter inflicting an icy pallor on its chassis. 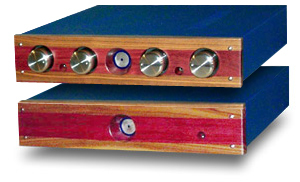 Blue Circles latest creation -- and statement preamp, I might add -- has been dressed in a deep blue powder-coat case. The control unit and external power supply use equal-size 17"W x 16"D x 4"H chassis. But wait. There is more to this than just bucking the basic-black mentality that seems common in audioland. The faceplates for both chassis have been handmade from a combination of walnut and purple heart wood with a slight bowing that tapers to the outside edges. The four knobs across the front of the control unit are deceptively unmarked, and they are not, as one would think, to control volume, balance, and input switching.. Each of these four heavyweight stainless-steel knobs is an individual stepped ladder-type volume control! No, Ive not suddenly become visually impaired; there are indeed four volume controls on this preamp. Ill get to more on just how all this works in due course. Completing the picture on the front is the now-commonplace illuminated blue-circle logo in the center, and two toggle switches to select which source is in use. Different, however, is the fact that the illuminated logo is recessed almost an inch into the heart of the composite wood faceplate, giving the AG3000 a unique appearance from previous Blue Circle preamps. To say that I loved the look of this preamp sitting on my equipment rack would be an understatement. I dont think any picture can do it justice; it has enormous drool factor. Even the deep-blue chassis grew on me. Blue Circle's Gilbert Yeung has since advised me that custom colors are available to order; each AG3000 is hand built by him, so they are only created in a limited number. The $11,500 USD AG3000 has to be considered a minimalist design. It has but two balanced inputs along with balanced outputs, all using Neutrik XLRs. It's designed from the ground up as a dual-mono, fully balanced circuit with four 6922 tubes (Sovteks supplied as stock). Again, this bucks the trend of previous Blue Circle designs, which were primarily single ended from start to finish. Missing altogether from this design is the presence of a tape monitor or any other frills that could get in the way of the music. The AG3000s power supply is yet another thing that sets the preamp apart from the crowd. The outboard power supply is a full B+ supply with all the polypropylene capacitors custom manufactured by Blue Circle, and not just used as bypass capacitors. This arrangement is costly to implement, but Gilbert Yeung indicated that critical listening during the development of the AG3000 deemed it worthy to include at this level of performance. Four custom-wound low-noise toroidal transformers feed the power supply along with high-speed HexFred rectifiers. This power supply is probably enough to make some power amplifiers green with envy. In case you think Im fooling here, check out the whopping 30-amp power connector, supplied on a custom-made Blue Circle power cord that has a nifty ground lift switch on board in case you end up with any grounding issues. Blue Circle advised me that they will custom terminate any power cord of your choice -- for a fee, however. I suspect most listeners will find the supplied power cord a sweet match. OK, so you know the AG3000 looks different and has four volume controls. But why four? Here's the skinny. The AG3000 is a dual-mono, fully balanced design from input to output, and as such, it runs two versions of each channel's signal through its circuitry -- one being out of phase with the other. Therefore, to maintain the signal as dual mono and fully balanced, there are double the signal runs that require volume adjustment -- from two to four. Obviously, Blue Circle could have used a single, dual-channel volume control for each channel and cut the number of controls on the AG3000 to two. Or, alternatively, they could have tried to jam all four channels into one big volume control and had just one knob. But given the fact that Blue Circle creates their own volume controls by hard-wiring carefully matched resistors, such doubling up would have made for an unsightly and cumbersome beast to say the least. Instead, they went one step further here and decided to give each phase of the signal its own control. Hence, there are two controls for the left channel and two for the right. There is actually a nifty side benefit to all this. By having the ability to adjust the two levels of each channel separately, you have the ultimate in flexibility over dealing with the phase characteristics of the presentation. The effect is also enhanced by each channel having its own independent absolute-phase switch on the back of the chassis (this is taking dual mono to the maximum!). In practice, this yields some pretty interesting results in dealing with recordings that may be deemed less than ideal, or compensating for some odd in-room gain artifacts. This is, by far, the most elaborate implementation of volume control I've seen. Rounding out this tour-de-force design is the addition of six (three per chassis) BCC1.0 isolation cones, which are pre-drilled to screw nicely into the bottom of each chassis, as well as a set of the single-ended-to-balanced connecting plugs for use with non-balanced sources and amplifiers. For this review, I listened to the AG3000 in the company of Blue Circle BC8 and AG8000 monoblocks. The source was my Sonic Frontiers SFT-1 transport with a Mark Levinson No.360 DAC connected by a Transparent Reference AES/EBU digital cable. I also used an Aragon 4T2 tuner with a Magnum Dynalab ST2 antenna. 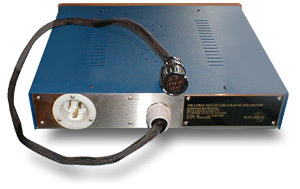 Balanced Gryphon Guideline Mk 2 interconnects were used to connect the DAC to the preamp, and the balance of the system was wired with Transparent Balanced Music Link Super interconnects and Music Wave Super biwire speaker cables. Power conditioning was either from an Audio Prism Foundation II or the Gutwire MaxCon. Comparison preamps were the Mark Levinson No.380 and the Blue Circle BC3000. Speakers were B&W Nautilus 804s. The AG3000 required a certain amount of time to sound its best -- on initial power up, it sounds a bit ordinary. But after a good 24 hours of juicing, it really starts singing its siren song. The spatial characteristics that make this preamp so magical fully develop beyond this point. After about a week of running the AG3000 in, listening along the way, I started to believe in the proverbial sorcerers wand, so adept was the AG3000 at deploying a musical event at the end of my room. Attempting to come to grips with the sonic fingerprint of the AG3000 became an exercise in chasing hyperbole. Music exuded a natural ebb and flow, which somehow just seemed right. It wasnt something I was initially conscious of at first, but the more I listened, the more this whole concept seemed to make itself apparent. Maria Joao Pires' piano work on Bachs Partita No.1 in B Flat Major [Deutsche Grammophon 447 894-2] was particularly stirring. There was a level of resolution to the left- and right-hand dynamic interplay that I had not been previously aware of. This was particularly evident on the prelude of English Suite No.3 from the same disc. This sort of revelatory exposure of the embedded layering to the music seemed to be what the AG3000 did exceptionally well and made it stand head and shoulders above the comparison preamps. And rightly so -- we arent talking about a $1500 preamplifier here, so for the asking price, I was expecting some pretty heady performance. The overall sonic balance of the AG3000 is particularly neutral, exhibiting little in the way of tube euphony or solid-state grain. Voice in particular was well served by the AG3000. Norah Jones' latest CD, Come Away with Me [Blue Note Records 7243 5 32088 2 0], displayed utter clarity and inflection on her rendition of Hank Williams' "Cold Cold Heart." Listening to "La Fiesta" from Carol Welsman's Inclined [Justin Time JTR 8478-2] let the sax solo absolutely breathe with life and harmonic accuracy; likewise the interplay between Welsman and piano was striking. Drums were taut and lively, with more apparent definition to the skin than I had ever heard on this recording. It didnt seem to matter what I played via the AG3000; I discovered newfound depths to the music, whether it was hidden detail emerging from within mixes, or just a total sense of hearing it in its entirety for the first time. There was no better example of this than U2s latest effort, All That You Can't Leave Behind [Interscope 548329]. Before the AG3000s arrival, I had almost written this disc off as being another poorly produced pop effort. Ha! The AG3000s flexible volume-control arrangement allowed me to mess with the gain a bit and make this CD sound just dandy. Bass performance was also first-rate, exhibiting precision and control. I never felt like I was listening to a tube preamp -- the AG3000's performance rivaling, or exceeding, the best solid-state units for extension and definition. New Order's latest, Get Ready [London Records 2 89621], exhibited lots of tightly defined rhythms down low on "Vicious Streak," on which there is a synthetic bass foundation working with the bass guitar. The AG3000 also worked its magic in the realm of pace, rhythm and timing, allowing lots of toe-tapping and grooving, easily passing along critical timing shifts in the bass that help define the music. Weight and extension were also excellent. The tympani from "Fanfare for the Common Man" on the Wilson Audio Ultimate Reference CD [Wilson Audio WA8008] was passed with as much muster and authority as my Nautilus 804s could dish out. The speakers actually surprised me as I thought I knew their limits in conveying the weight of this piece. With the AG3000 in the system, there was more weight, snap and dynamic expression evident. The treble performance, long a hallmark of Blue Circle designs because of its smoothness and articulation, is well served again with the AG3000. The highs are silky smooth, with extraordinary amounts of layered detail available. Ultimately, the AG3000 became a reference point for me in the highs, allowing huge amounts of information to be revealed from my speakers without grain or fatigue. This was really made apparent listening to the string section in the opening Allegro in Mozarts Clarinet Concerto K622 in A Major [Musical Fidelity MF018], with Music Fidelity's Antony Michaelson on clarinet. There was a natural extension and layering to the string section, along with a really beautiful rendering of the acoustic envelope surrounding the instruments. It is here that the AG3000 made very short work of the other preamps I had on hand. No other preamp Ive had in my system has been able to convey the treble in such a natural, unforced yet informative manner. Ironically, with my Aragon 4T2 tuner hooked up to the AG3000, I found that this source had some serious sonics to offer. I primarily use the 4T2 for background listening; however, through the AG3000, the Aragon tuner became something more than just a vehicle for ambient noise. It sounded lush, alive, and more dynamic than I had experienced in the past. Why is this important to mention? Primarily for those who may be wondering about how single-ended sources would sound when connected to the fully balanced AG3000. In the case of my tuner, the sound was quite ear opening, and I developed a newfound respect for that old soldier. However, if you have the balanced-output option available to you from your source, use it! In the case of the Levinson No.360 D/A converter, I was able to compare directly the single-ended and balanced outputs into AG3000. The difference was far from subtle, with the balanced outputs adding substantially to the firmness and definition in the bass, as well as the openness and articulation in the midrange and treble. Some of this was due to the use of dual-differential DACs in the No.360, but I suspect that using the AG3000 as it was intended played a role too. Making comparisons to a preamp of the AG3000's quality can be tough. Ideally, its main competition comes from the big Audio Research Reference Two Mk II, which is also fully balanced. However, I didn't have one of these on hand. I did have the the Mark Levinson No.380, and my former reference for pure sonics, the Blue Circle BC3000. The No.380 is a solid-state unit, however, and the BC3000, Blue Circle's former top-of-the-line preamp, is a unit that has been reviewed here at SoundStage!, albeit back in early 1999. In addition, Doug Schneider currently uses the BC3000 as his reference. Sonically, there was a touch of familial sound to the two Blue Circle preamps. Both were masterful at revealing instrumental texture in the midrange; however, the AG3000 goes further, revealing more in the way of ambient cues and timing signatures. Bass extension and focus are perhaps the big winners with the AG3000. Here the BC3000 shows its limitations, sounding soft and lacking the same G-force ability of articulation and depth. The AG3000's treble is also more extended and focused, along with more "air up there" being apparent. The comparison to the Levinson No.380 was certainly an interesting one. The No.380 is one of my favorite solid-state preamps. It offers enormous flexibility, a fantastic volume-control system, and a good overall sonic balance. But purely on a sonic-performance basis, the AG3000 leaves it trailing behind in a plume of smoke. Comparative listening to Diana Kralls latest The Look of Love [Verve 3145498-462], I found the system sounded somewhat more ordinary with the No.380 in place. Krall's voice sounded smaller and lacked body. While both preamps created a credible soundstage, the AG3000 seemed more assured in positioning instruments and voices, along with generating a greater sense of depth and width. Both preamps were good at retrieving low-level information, yet on the large-scale dynamic swings, the AG3000 seemed better able to go for the gusto with no strain, leaving the Levinson No.380 sounding rather closed-in by comparison. Blue Circle's reference preamp is just that -- a reference point. It has managed to subtly convey more of the music than I thought my rig was capable of rendering. It never failed to pass on the essence of the performance on both the conscious and often sub-conscious levels, whereby things just sounded right. For my own experience, the AG3000 has set a new level of expectation for Blue Circle products and established itself as one of the finest preamplifiers available. But the AG3000 is not for everyone. Those seeking remote control or extreme switching flexibility will have to look elsewhere. But for those who seek one of the finest two-channel preamplifiers out there, the AG3000 may be the ticket. Its not a cheap ride, but the sonic thrills are memorable, and when used in a fully balanced system (which it deserves), the AG3000 can be downright delicious.